What to do in the garden in December? The truth is, even here in the sunny south there isn’t a lot of excitement garden wise going on in the month of December – which isn’t an entirely bad thing of course. At the very least it’s a chance to look forward to next season. Nonetheless, there are a few things that need to be done. If you are an on-the-ball fall gardener you don’t need to be told that you have cabbage, broccoli, cauliflower, greens of all kinds, carots, jerusalem artichokes, celery, radish, spinach and all manner of good stuff to deal with. The rest of us need to remember this next August when we should be planting instead of lounging by the pool. If you haven’t already done so it’s high time to get rid of any crop residue that’s left – mummified fruits are very likely to harbor disease or pests – remove or burn anything like this. Mid November brings the first hard freeze - and frost painting on the cold frame. Plant Garlic now to harvest next summer – buy bulbs right from the grocery store, divide them into cloves and plant 2″ deep and about 7 inches apart (intensive) with the pointy end up. Plant Spinach now for fall harvest – you may have to use cloches or row covers in a few weeks depending upon your zone to extend the harvest. This is also a good time to plant horseradish roots (straight from your grocers shelf) for harvest next fall (and ever after – it’s a persistent perennial) but consider planting in a plastic laundry basket or other large container sunk into the ground (with drain holes of course) to keep it from becoming invasive. Plant turnips as a winter cover crop that will also yield greens and turnip roots. Plant crimson clover as a green manure/cover crop to turn under or cut for compost next spring. Plant lettuce and other salad greens either to be covered later to extend harvest or in containers to take into a sunny window for winter greens. Stockpile grass clippings for making autumn compost when leaves start to fall. Use up any finished spring compost that you still have. Clean up crop residues and generally clean up the garden as summer crops finish up. Plan to prepare ground soon for mid winter planting (spinach in February, snow peas in March for example) while it can still be worked. Enjoy those last tomatoes – it’s gonna be a long time before next year’s crop. Broadcast seed – early September is the best time for sowing cool season grasses like fescue or blue grass. Consider adding white Dutch clover (or other small clover) to your lawn seed. Clover is good for the soil – birds love it, bees love it, deer love it (which may be good or bad according to how you feel about deer) and it makes great compost – drawbacks are that it is somewhat invasive (nothing like Bermuda grass though) and your neighbors will think you’re nuts if they find out. Aerate if you get a chance after a soaking rain when the ground is softened. Fertilize very lightly if at all. It’s hard to believe in our sweltering August heat, but fall is just around the corner. Time to think ahead. Have you ordered bulbs? If not, don’t delay. Daffodils, tulips, hyacinths, snowdrops, etc. all need planting in fall. When I think Fall, I think mums and pumpkins. Mums are the very essence of the season. Problem is, they’re difficult to grow in the Deep South. There are a few good perennial ones that grow here: Sheffield, Ryan’s Pink, Clara Curtis, and Ryan’s Yellow, to name a few. They all have daisy formed flowers and they all tend to be pretty aggressive plants. I grow them anyway. But I want a deep gold or bronzey red colored bloom for fall. If I buy mums at the store, they’re expensive, they bloom only once, and if it’s hot outside, they don’t last more than a week. Answer? Marigolds! If you plant some marigold seed in pots now, they’ll be fresh and blooming by October and will keep blooming until frost, which, in my area, can be as late as Thanksgiving. If your daytime temps are over eighty now, you’ll need to get the seeds germinated indoors. I sow seeds into potting soil, water well and drain for a good half hour. Then I slip the pots into Ziploc Bags and put them in bright light. They’ll germinate in a week or less, and once they have a set of true leaves, you can move them outside. Put them in bright shade for a few days, and then harden them off by moving them into the sun for a couple of hours the first day, an hour or so longer the second day, etc. If you have a day or two of rain or very cloudy days, that’s the perfect time to move them into full sun. By the time the clouds are gone, the plants can take the full heat and glare. Finally! At last! Autumn has arrived in East Central Mississippi! I know my brother, David, is enjoying the spectacular fall color in his central Tennessee home. I try not to think about that too much, and just enjoy being able to get outside without worrying about heat stroke. Besides, our color will show up in about another month. For now, I am grateful for temps in the eighties. So…I’m celebrating fall by thinking…spring. The early spring garden relies heavily on flowering shrubs (azaleas, especially), cool season annuals like pansies, and bulbs. There are very few perennials that get blooming much before April, at least not here in the deep south. This makes me even more aware of the importance of bulbs, not to mention how early some of them get going! I get very, very hungry for flowers once Christmas is over. And nothing satisfies that hunger like Daffodils. 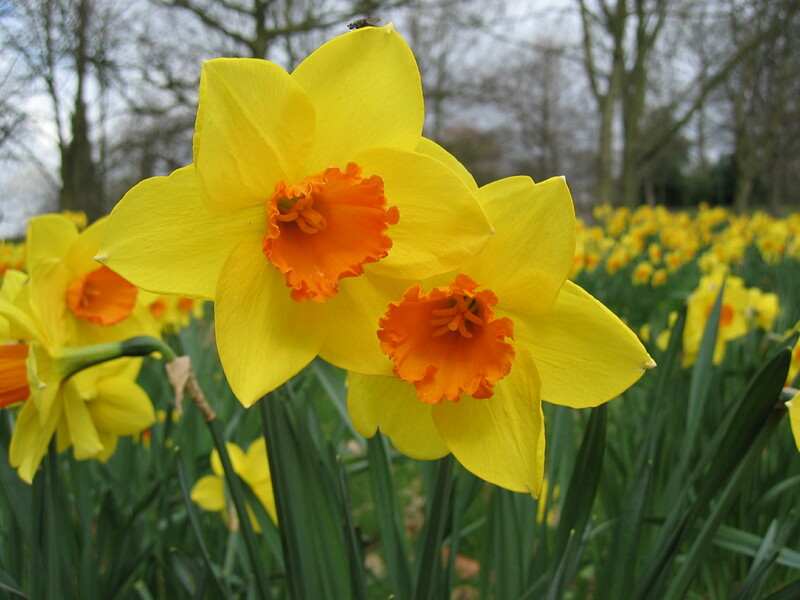 » Read more: Fall Means Daffodil Planting! It’s Fall! The Weather’s Great! So, what’s to do in the garden? Plenty! In the past week I have been digging and dividing daylilies. I grow primarily hybrids, and they benefit greatly from division about every three years. As I lift them, I dig in a half bag of composted manure into each hole, plus a sprinkling of Potash. I never seem to have any trouble finding eager hands for the extra daylily plants. This fall, I am planting a clump of daffodils midway between each daylily clump. That will give me lots of early spring color, but the spring daylily foliage will hide the unsightly daffodil foliage. » Read more: It’s Fall! The Weather’s Great! You are currently browsing the archives for the Garden Schedule category. © 2019 The Door Garden · Proudly powered by WordPress & Green Park 2 by Cordobo.